The Callidulidae and their higher classificatory status have been studied in detail by Minet (1986, 1987a, b, 1989, 1991). The larva and pupa in subfamily Callidulinae have been investigated by Tschistjakov & Belyaev (1987). Minet (1989, 1991) recognised three subfamilies: Callidulinae, Griveaudiinae and Pterothysaninae. Only the first is represented in Borneo. The monophyly of this grouping he based on seven apomorphic features of the adult: the subapical part of the antenna is bent, with the apex turned up; the foreleg has an apical pair of stronger spines on the fourth tarsal segment, but without well- developed spines on the fifth; vein R4 of the forewing reaches the termen; in both wings M2 arises nearer to M3 than to M1; the male lacks a subcostal retinaculum despite the presence of a frenulum in at least some representatives; a sclerotised bridge uniting the valves is present, ventral to the juxta; the ovipositor lobes are flat, each distinctively bilobed. These apomorphies are relative to the general position of the Calliduloidea within the Macrolepidoptera as in Fig 1(below). They appear to be related (Minet, 1991; see also Kristensen & Skalski (in press)) to the butterflies, Drepanoidea, Geometroidea and the Mediterranean Axioidea, sharing three features; concealed labial palps in the pupa; reduced fenestrae laterales; a modification of the adult thoracic metafurca. The tongue is well developed, though short in Pterothysaninae. The wings are held vertically at rest in the Callidulinae, much as in many butterflies with which they can be confused in the field, being mainly day-flying. The Griveaudiinae hold their wings in a roof-like manner when at rest but the resting position of Pterothysaninae is unknown (Minet, 1989). Ocelli and chaetosemata are present except in the Pterothysaninae which lack ocelli. The Madagascan Pterothysaninae and Griveaudiinae are nocturnal whereas the Oriental Pterothysaninae are diurnal. The Callidulinae may be partially nocturnal as they may come to light at night (e.g. Tetragonus catamitus Geyer). Most early stage information for the group is from the Callidulinae, though a pupa for one of the Madagascan Helicomitra Butler (Pterothysaninae) was described by Minet (1987b). Tschistjakov & Belyaev (1987) described the early stages of Pterodecta felderi Bremer, the most northerly of the Callidulinae, ranging to 45 degrees north in eastern Russia and the southern Kurile Is. Some information on other callidulines is presented in the generic sections following. The egg is smooth, oval, flattened. The larval head is hypognathous. Secondary setae are absent. Apomorphic features in the chaetotaxy are the presence of only the SD2 seta on the prothorax, and the positions of the lateral group setae on the abdominal segments. There is a gland below seta L2 on the first abdominal segment. The prothoracic shield is wide. All prolegs are present, their crochets in a biordinal circle. A calliduline larva is illustrated below. In the pupa there are callus-like hillocks on segments 2-4 of the abdomen (not seen in Helicomitra). The cremaster is a dense bundle of about ten long, strong, curved setae in Pterodecta felderi. Such processes are also present in Tetragonus but absent in Helicomitra. The larval and pupal morphology suggested a relationship with Pyraloidea to Tschistjakov & Belyaev (1987), especially the hypognathous larval head, with the frons united to the clypeus, the prothoracic shield, the formation of the crochets, and, in the pupa, the presence of maxillary palps. This affinity is not supported by Minet (1991). 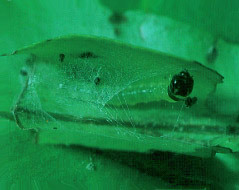 Calliduline eggs are laid singly on the edge of host-plant foliage, and the larvae roll leaflets or groups of leaflets together with silk, living and pupating within the roll (Bell, MS; Barlow, 1982), another parallel with the Pyraloidea. The recorded host-plants of Callidulinae are exclusively ferns, with the genera Matteucia and Osmundastrum noted for Pterodecta felderi by Tschistjakov & Belyaev (1987). The composition and higher classificatory position of the Calliduloidea have been topics of some dispute in the literature. Heppner (1993) included the Afrotropical Hibrildidae with the Calliduloidea, though this group is placed in the Bombycoidea by Minet (1989, 1991). The family Ratardidae has also frequently been associated with the Callidulidae in recent literature (e.g. Heppner & Wang, 1987; Minet, 1987a, 1989; Heppner, 1993), an association first suggested by Hering (1925) in relation to the Pterothysaninae, though Holloway (1986a) and Holloway, Bradley & Carter (1987) referred the group to the Cossoidea. The history of the classification of the group is reviewed by Heppner & Wang (1987), Owada (1993) and Edwards et al. (in press). The first authors listed known taxa in the family, though omitted Ratarda javanica Roepke from Java. Hering based his association on similarities of wing venation, lack of a frenulum and absence of a tympanal organ, none of which carry much weight in a cladistic sense. Minet (1987a) noted potentially more useful characters, such as the sharing of bilobed ovipositor lobes, also seen in Metarbelidae of the Cossoidea (Holloway, 1986), and loose, elongate scales on the wings, when suggesting the ratardids and callidulids were sister-groups. Heppner (1993) is the most recent author to place the Ratardidae in Calliduloidea. Since 1987, further light has been thrown on the situation by the discovery and morphological examination of males of the Ratardidae (Kobes & Ronkay, 1990; Owada, 1993), one of which had been misclassified in the Lymantriidae (Shisa excellens Strand). The male characters support placement of the Ratardidae with Cossoidea rather than Calliduloidea, as the abdominal characters, particularly of the genitalia, are almost identical with those of the Metarbelidae (Owada, 1993). This association was endorsed by Minet (1991) and by Edwards et al (in press), though with Metarbelinae and Ratardinae placed as subfamilies of the Cossidae by the latter. Minet (1987a, b) placed the Calliduloidea within his Obtectomera grouping of subfamilies (Minet, 1986). Inclusion of Ratardidae in this leads to the prediction that the first four abdominal segments of the pupa would be fused, immobile: the early stages of Ratardidae are currently unknown. The larvae of Callidulinae are defoliators, with morphological (Tschistjakov & Belyaev, 1987) and behavioural (leaf rolling) characteristics that suggest a relationship with the Pyraloidea. If calliduloid, then ratardid larvae are also likely to be defoliators. If cossoid, they would be stem or bark borers. Minet (1991) noted further characters defining Obtectomera and subgroups within it leading to a Macrolepidoptera grouping that includes Calliduloidea, the butterflies with Hedyloidea and the concept of Geometroidea (See Geometroidea). These include: a dorsal lobe to the pulvillus; a modification of the first axillary sclerite of the forewing base; concealment of pupal labial palps; reduced fenestrae laterales; modification of the adult metafurca. The pulvillar character is absent from Ratardidae (Minet, 1991): the others require investigation. This Macrolepidoptera grouping of superfamilies within the Obtectomera is supported by Kristensen & Skalski (in press) and illustrated in Fig 1. Figure 1. Phylogeny of the Macrolepidoptera as suggested by Minet (1991) and Kristensen & Skalski (in press). Superfamilies are indicated in capitals. Groups treated in this work are indicated in bold. The weight of evidence currently to hand supports association of the Ratardidae with the Cossoidea (e.g. Minet, 1991; Scoble, 1992; Edwards et al., in press) rather than with the Calliduloidea. The Callidulinae range from India and southern Siberia through the Indo-Australian tropics to the Solomons but not Australia (Common, 1990; Nielsen, Edwards & Rangsi, 1996). The Papuan Subregion fauna is diverse, though much of this diversity occurs in lineages within Callidula Hübner itself (See Callidula Hübner). However, Minet (1989 ) suggested the genus might be paraphyletic. The genus Comella Pagenstecher is endemic to New Guinea: it has two large coremata associated with the eighth segments, where the sternite is wishbone-like as in Callidula, but the eighth tergite is reduced to a narrow, arched strip of sclerotisation. Thus, apart from Tyndaris, the greatest morphological diversity in the Callidulinae is Oriental. Minet (1989 ) indicated a sister-relationship between the Callidulinae and Madagascan Griveadiinae. The Pterothysaninae also include Oriental and Madagascan taxa but the former do not extend to Sundaland. Minet, noting the absence of the family from the African mainland, suggested an association between Madagascar and India post-dating separation from Africa, with separation of Madagascar and India at the end of the Cretaceous, leading to the double vicariant patterns between the two seen in the Callidulidae today. This contrasts strikingly with the situation in the Castniidae (see Castniidae) and by Holloway & Hall (1998). It is also not consistent with the current consensus on separation of fragments of Gondwanaland (e.g. Hall, 1998). However, exchange of biota across the Indian Ocean involving Madagascar, India and the Asian mainland may have been facilitated by the juxtaposition of continental fragments at that earlier time.